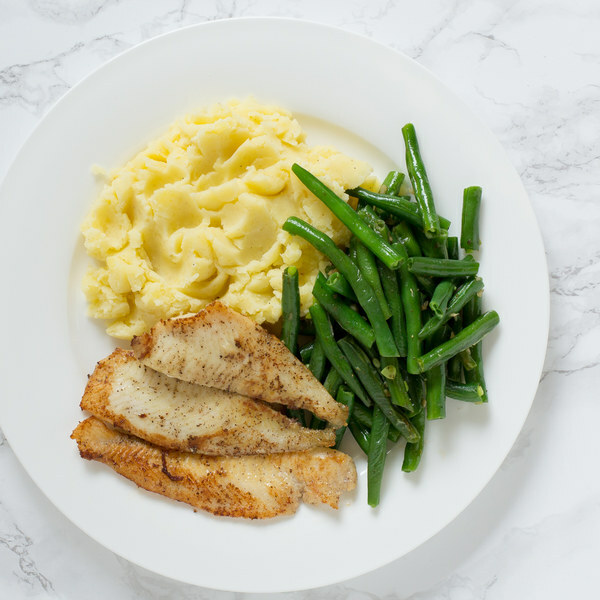 ← Pan-Fried Sole with Mashed Potatoes & Green Beans. Peel the potatoes, then halve lengthwise and crosswise; transfer the quarters to a small saucepan. Cover with hot water (from the tap) by about 1 inch and bring to a boil over high heat. Trim and discard the ends of the green beans, then halve the green beans. Transfer to a medium bowl. Once the water in the saucepan is boiling, reduce the heat to medium and cook until the potatoes are tender when pierced with a knife, 8 to 12 minutes. Once done, reserve about 1 cup of liquid and drain the rest. Cover the saucepan to keep warm. Add butter to a nonstick skillet and preheat over medium heat. Pat the sole dry with paper towels and place on a plate; season with salt and pepper on both sides. Once the skillet is hot, add the sole; cook until it is cooked through and golden brown, 2 to 4 minutes per side. Once done, transfer to a plate. Once the sole has been transferred, add the green beans to the skillet and pour in ¼ cup of water. Bring to a boil over high heat; once boiling, cook until bright green, 2 to 3 minutes. Add the garlic, butter, salt, and pepper to the green beans. Cook until the water is fully evaporated, another 1 to 2 minutes. Add ½ of the reserved liquid, butter, salt, and pepper to the potatoes; mash with a potato masher until smooth. Add more liquid to thin out the mash if needed. To serve, divide the mashed potatoes, green beans, and sole between plates. Enjoy!